Recently, a friend and blog reader made a request. She asked for a how-to post on burgers, not unlike the one I did for steak or slicing an onion. And because I really appreciate requests, and Erin is awesome (she gave Dan and I internships with her institution and is practically the reason we’re married), here it is. 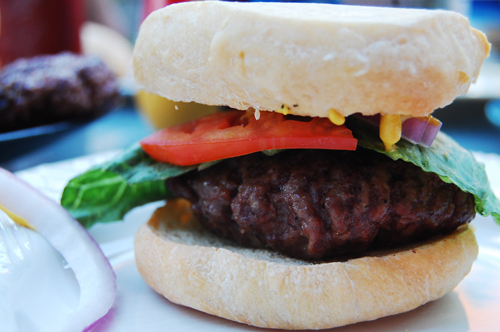 i know that I’ve posted other burger recipes on this site that include a lot of pop and whiz but usually, when we eat hamburgers, we’re purists about the burger itself. That means ground beef, usually somewhere in the 80% lean range, with sea salt and pepper. This is enough for me, it lets the flavor of the beef and the grill speak. And that’s the flavor I want. First, you want to season your meat. In a large bowl, combine ground beef with 1 tbsp of salt and 1/2 tbsp pepper. Next, it needs to be shaped. Shaping a burger is a two step process. 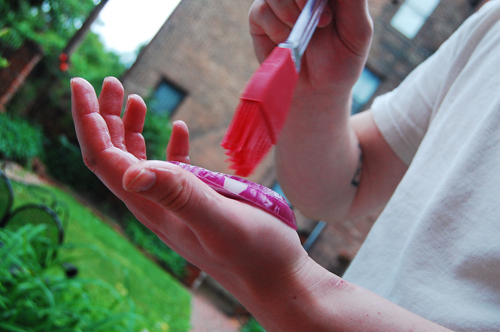 Start by putting about a quarter cup to a third of a cup’s worth of meat in your palm. 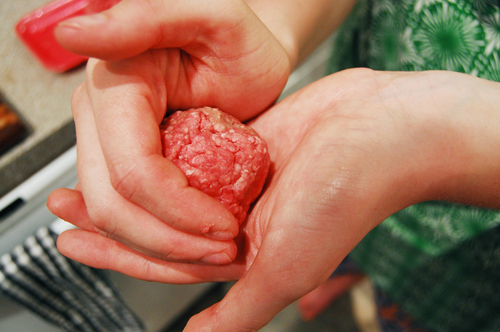 Use your hands to shape the meat into a firm ball, nicely round and totally together. Then, use both hands to flatten the patty. The burger should be 4 or 5 inches in diameter, and 1/2″ thick. Now, get your grill nice and hot. 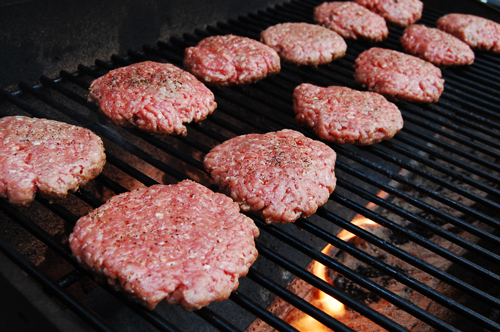 Once your grill is ready, give your patties a final squish (particularly in the middle where they tend to puff), and throw them on the grill. 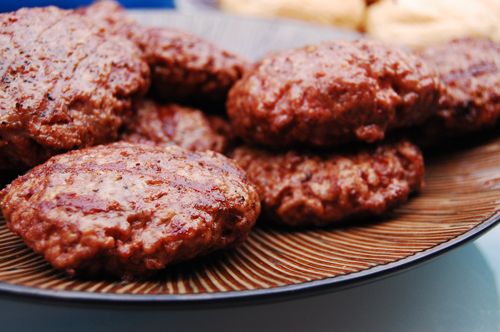 For a burger cooked to a medium doneness, which is slightly pink in the middle, cook it for 5-7 minutes each side. Just like with steak, you only want to flip it once. Stick it on the grill, put the lid down and walk away. Resist the urge to press it down with your spatula or hover, it needs to cook. Flip, and cook an additional 5-7 minutes. For a burger cooked medium rare, bring the time down to 3-5 minutes per side, and for medium well, bump up to 7-9 minutes. Let rest a few minutes and enjoy! This weekend was full of interesting things, such as cookouts (called “barbeques” by all our new Maryland friends (that I have now offended by correcting them, in person and on the interwebs)), and me offending even more people by stating that I think the Maryland license looks like something a 12 year old printed at home, especially compared to the glory that is the North Carolina license. In there between offending people I photographed a three day old, played guitar hero (rock band?) for the first time, and nearly killed all my seedlings by exposing them to the July like weather. Also, I made a strawberry tart. For the cookout. Let me just say that I’ve been experimenting with my doughs. And while everyone knows you don’t mess with a good thing, I can’t help myself. I’ve been adding sour cream, playing around with flour/shortening ratios, and changing my techniques. The results have been hit or miss. Sometimes they look and taste perfect, other times they look great but taste mediocre, and sometimes they taste amazing but look like something that got ran over. This pie was the latter. It looked just miserable, all squashed and deflated, but it tasted phenomenal. My issue was a shortening to flour one, it just wasn’t right, so with this recipe I’ll give you my traditional, always works even when you *try* to mess it up, dough recipe. 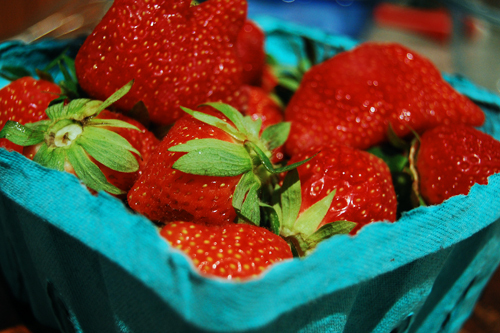 You should try it, especially while strawberries are BIG and HUGE and full of BIG HUGE FLAVOR. It’s pretty fail proof, unless, apparently, you’re me. Make your dough, as instructed. Slice your strawberries. In a large bowl, toss in the juice from your limes. 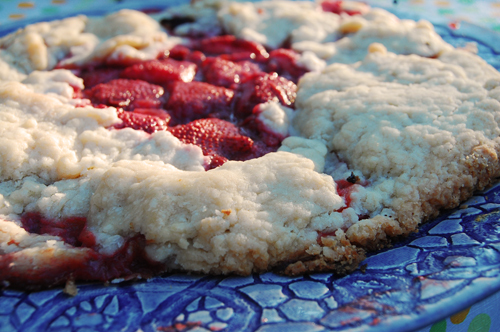 Set aside approximately half of your strawberry slices. To the remaining half add sugar and corn starch. 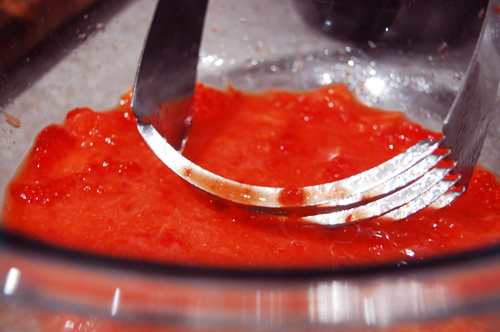 Toss, and then use a fork or pastry knife to mash. Roll your dough out to 1/4″ thin. 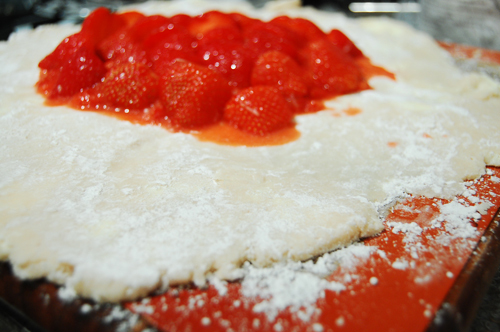 Use a slotted spoon to transfer your mashed berries to the center of the dough. 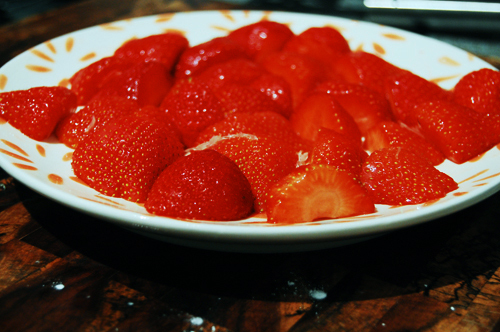 Over top, arrange remaining strawberries in a circle. Fold the edges of the dough over the berries so they are less than halfway covered. Brush dough with egg. Brush strawberries with honey. Bake at 375 for 20 minutes, or until golden brown. You know those moments when you say “Hot Damn! 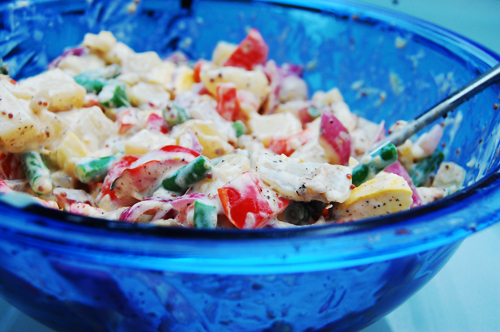 This is the best thing I’ve ever made!” Yeah, I totally had one of those moments with this potato salad. Last night Dan and I went to our first cookout of the season (which was, all night, inappropriately called a barbeque) and I partook in a few varieties of potato salad. And there was a moment when I thought, wouldn’t this be amazing if all the vegetables were grilled, if everything was cooked but also just a little charred? And really, seriously, it was. It was so good. Hands down the best potato salad I’ve ever had, and seeing as how I’ve been to more church potlucks and picnics than I can count, that actually means something. The new apartment has (among other great things), a yard. And since we’re on the ground floor, our door opens up into the yard which contains a patio, a garden, and a grill! 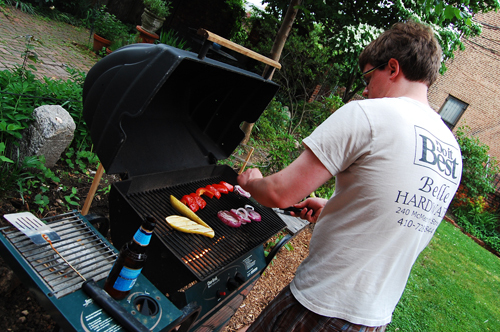 We’ve been here a week and already the grill is our favorite part. I see a large amount of grilling in our future. I grabbed a handful of my favorite summer vegetables, but you could vary this recipe to include whatever you wanted. I see this potato salad as a staple in our summer, changing as our garden produces new vegetables and as things come and go out of season. 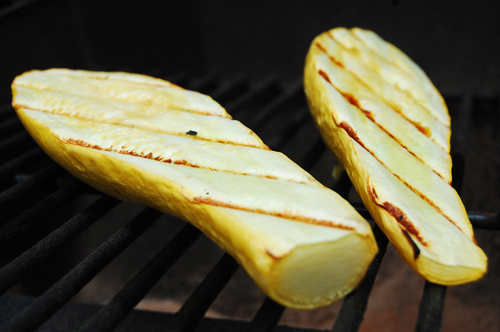 No matter what ingredients you’re using, the vegetable to grill sensation is outstanding. I’m almost without words, which Dan will tell you is a rare occasion. Boil potatoes for approximately 20 minutes or until cooked through. While your potatoes are boiling, slice your squash in half, cut your peppers in thick strips, and slice your onion, lengthwise, in thick layers. 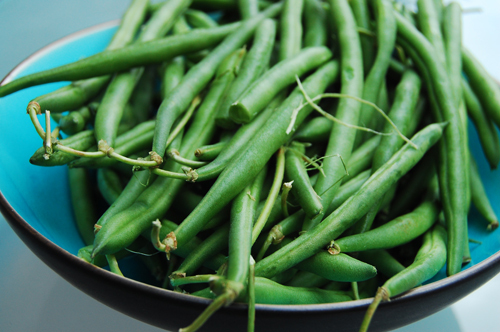 Snap your green beans. 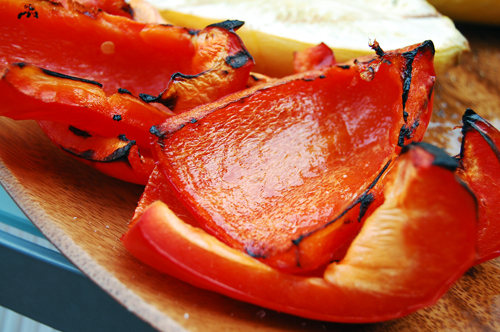 Get your grill fired up. 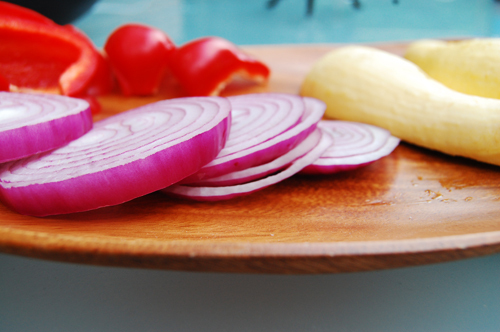 Brush all of your vegetables with olive oil and season with salt and pepper. Put your squash on first, then your peppers and onions about ten minutes later. Cook another ten minutes, and turn. Once your potatoes are cooked, scooped them out of the water and drop your beans into the boiling water. Cook 2 minutes and strain. 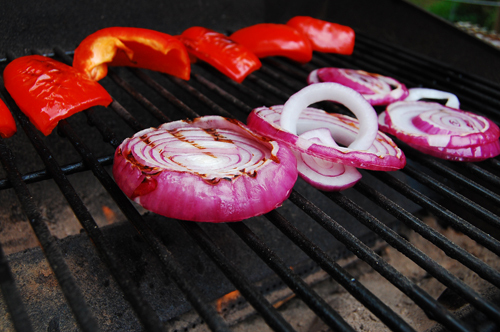 After your vegetables on the grill have cooked another 10 minutes, remove them. Roughly chop everything (I like a chunky potato salad) while it’s hot and mix together. Add mayonnaise, mustard, and seasoning. Give it a good turn and serve hot, or chill and serve cold. And enjoy!